If you manage a California laundromat, commercial laundry operation, hospitality business, or any business that is in need of commercial washers or dryers, you could benefit from purchasing your new equipment and putting it into operation before December 31, 2018. Section 179 of the IRS 2018 tax code allows U.S. businesses to deduct the full purchase price of qualifying equipment during the tax year in which the purchase is made. This is different from the traditional method of depreciating assets over a multi-year period and could help your business save in the long term. In order for equipment to apply for a 2018 deduction, it must be purchased and installed by December 31, 2018. So if you think your business could benefit, don’t wait. Act Now! If your business could benefit from purchasing commercial laundry equipment before the end of 2018, why not browse our washers and dryers below. Of course, no matter what time of year you make your purchase Golden State Laundry Systems has the best selection of energy-efficient commercial laundry equipment in California. To find out if your business can benefit from Section 179 deduction, make sure to consult with your CPA or tax professional. Want to learn more about Section 179 deductions? 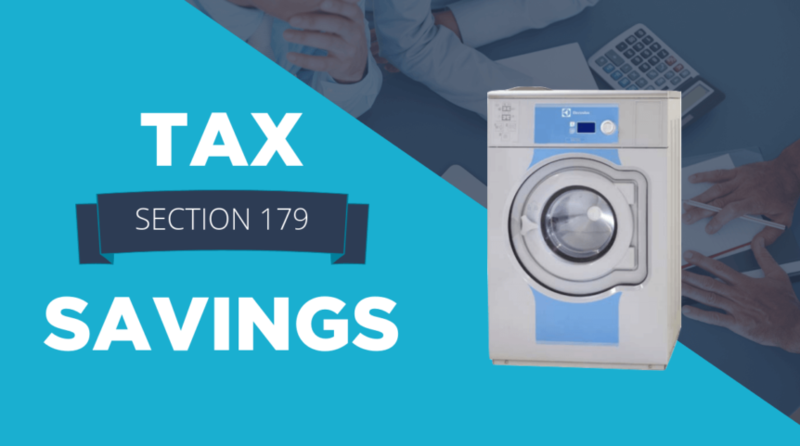 Read this helpful blog post from Laundrylux and visit section179.org. If you want to learn more about our commercial laundry equipment and business-saving solutions, get in touch with Golden State Laundry Systems. Our experts can answer all your questions and help you every step of the way.